Come see my Wiggleworm Fluff! I love Amy. These are my covers I ordered awhile ago. Pretty pretty pretty. 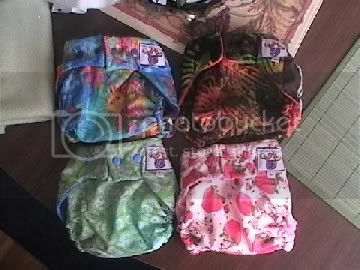 The bottom two (green/blue batik and strawberry shortcake) are customs that she made for me from fabric I sent her. Toot sweet baby. I got these in a large so they'll last and with snaps because I'm not having dd take off a poopy diaper again before I can get to her. Yay, happy fluff day! James Tierney ~ 4/2/2010 7 lbs. 12 oz. 20"